Authored by ngraham on Mar 8 2019, 4:01 AM. 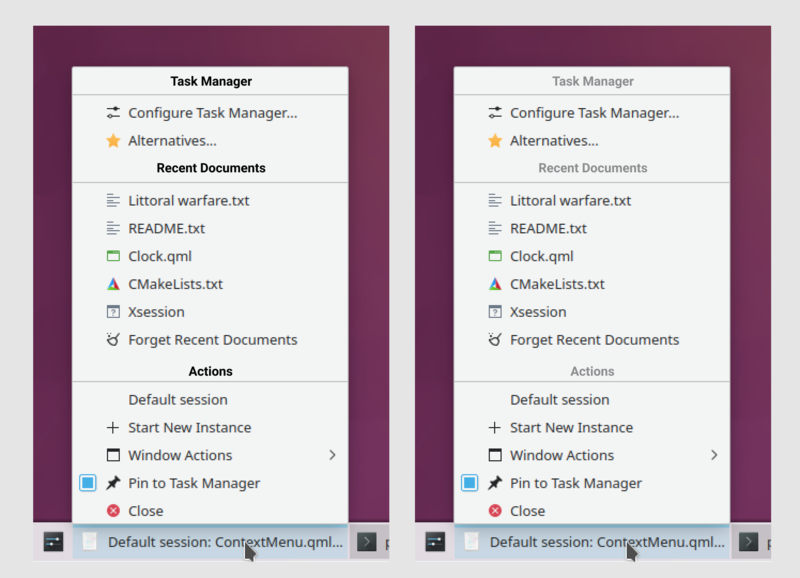 ngraham retitled this revision from [Task Manager] Reorganize improve presentation of context menu to [Task Manager] Reorganize and improve presentation of context menu. One issue I have with this patch is that sometimes the Alternatives menu item doesn't appear under the right conditions anymore, and I need to do visible: alternativesAction && !alternativesAction.visible instead, which is obviously wrong. This doesn't happen all the time though. Debugging assistance would be appreciated. ndavis added subscribers: trickyricky26, ndavis. I like it overall, but some of those icons need changing. 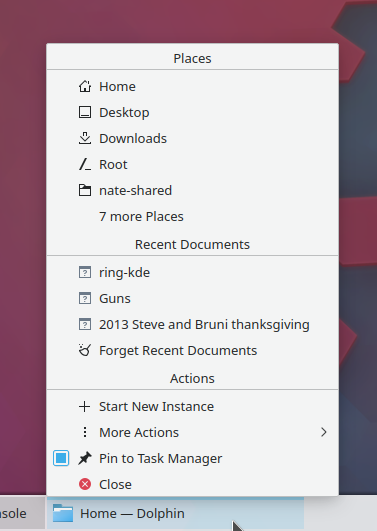 Not just here, but in breeze-icons as well. 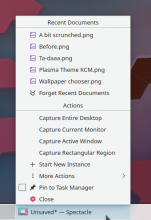 Resize: I don't like how busy that icon looks, but I"m not sure if it's worth it to make a new icon just for resizing windows. Maximize: The maximize icon is more like a "Maximized" icon because we normally use the up arrow for "Maximize". @trickyricky26 is already working on the shade icon and I know you requested keep-above and keep-below icons, so I'll ignore those for now. Why was this changed from view-fullscreen? 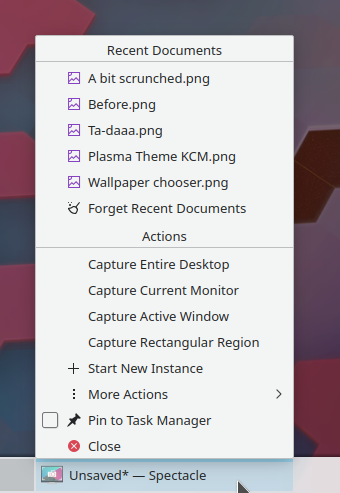 Yeah, these need to be fixed in Breeze icons. Overall I must say I'm quite a fan. I don't like the Settings and Alternatives entries at the top, they draw most attention to them for actions that should rather be least intrusive. 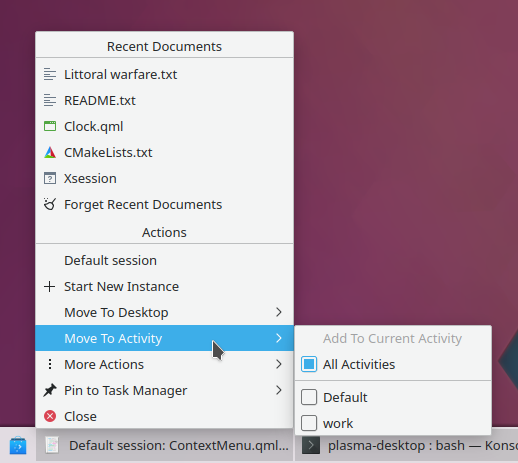 I would prefer the jump list actions stuff at the top but grouping them with the other window/application actions is an interesting approach. 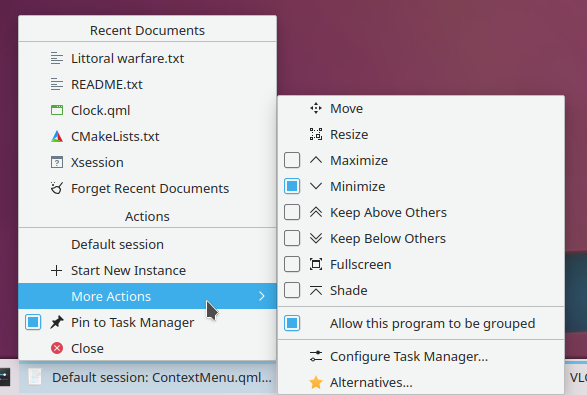 While I personally don't use the Minimize/Maximize actions in the menu I've seen people get quite passionate about them. Did you test how media controls behave in this scenario? Also please make sure keyboard accelerators (Alt key, the & stuff) are sane. 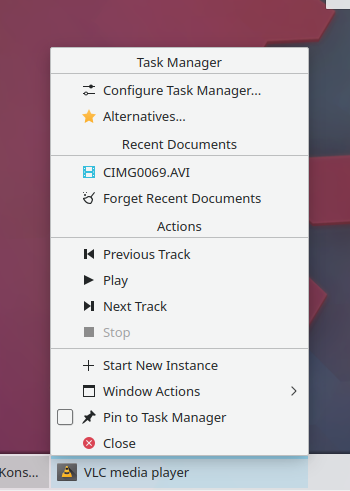 Also keep in mind to adjust KWin's title bar menu to use the new icons as well. Perhaps add some context explaining %1 is plasmoid title? Yes, I agree that we need to improve the header appearance, but that needs to be done elsewhere in the theme style itself, not here. I tried putting them at the bottom, but the problem there is that then the Close action isn't right at the bottom anymore, which didn't feel right. Maybe we should give that section its own Media Playback header that's separate from the other actions? Or maybe we should remove the separator so those items are a full-fledged part of the action settings? Open to opinions. ngraham marked 5 inline comments as done. 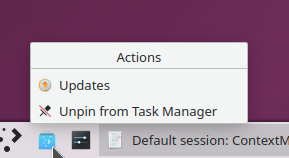 Also, I do get a lot of user reports every time the window title bar menu and the task context menu diverge. 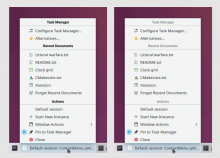 Personally I've never felt that they need to match because tasks aren't windpw title bars, but it's worth keeping in mind. Yeah, I do understand the criticism that this makes it really tall. Originally I had the three-item Task Manager section in a sub-menu, saving two slots. But it didn't look and feel as good in the end. 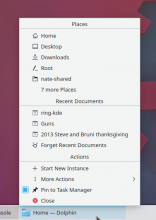 Ultimately I'd like to see us put some more work into defining just when Widgets should actually be configurable and replaceable, because the three-mode system we have right now is kind of awkward. See T10190: (Re)define modes when editing panels and widgets. That said, I really like the logical separation between sections that this patch produces and I'd like to keep that. I can submit a patch to make it as close as possible if and when this lands (well, the parts of it that are duplicated here, that is). I really like this one! I'd +1 that. Hm, is moving "Minimize" one level deeper an UX improvement? Is it worth to create a bug about this issue? The problem is that the more things you put on the main level, the more overwhelming it looks, especially for apps that have recent docs and jump list items. 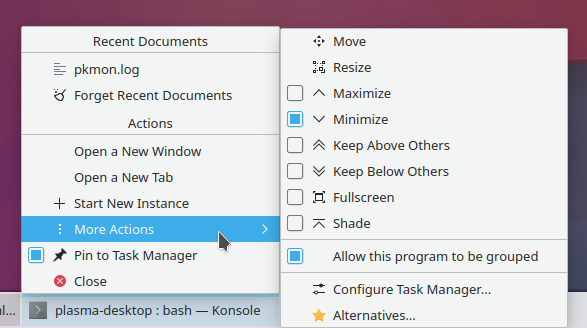 I didn't think that having minimize on the main level of the menu was important since it's easy to minimize by just clicking on the task button itself. If it's not focused, just click it twice.